An Owners' experience like no other. That’s why you always come first at Ciaron Maher. At Ciaron Maher Racing, they’re dedicated to ensuring Owners enjoy every step of the process to the winners’ circle. We can’t guarantee you racetrack success (nobody can) but we can guarantee fun. Owning a horse should be one of the most thrilling adventures of your life. Ciaron’s strike rate is one of the best in the country but you’re never going to win every race. It’s crucial that our owners have an engaging, successful and most importantly, fun experience. Co-Trainer David Eustace said: “Obviously every Owner knows that when they go into a horse, not every horse is going to win, some just don’t, know matter how good your strike rate is or how hard you try. “It’s not all about winning, obviously we try but at the same time, when horses lose we still want to have fun so it’s really an important part of what we want to provide. Owners Come First - Join the Dynamic / Ciaron Maher & David Eustace Team today. If you’re overseas, interstate or you’re just not a fan of the early starts, you can always watch your horse’s professionally-filmed track work from the convenience of your smart phone, laptop or smart TV. Communication is very important for Owners, it’s what keeps Owners involved. Owners want to know and some trainers and racing people don’t understand how much they desire to know what’s happening. The more we give our Owners, the happier they are. The stable started doing videos of the gallops on Tuesday mornings and got really positive feedback. We are trying to be as informative as we can and keep connections and owners in touch with the horse and how it’s going. Technology has advanced and the industry has to do the same. Previously owners only saw their horses on raceday but now they get weekly videos or photos or voice reports and it’s really important that we keep improving that service. Ciaron Maher Racing chose to support the Peter MacCallum Cancer Centre as their charity. This is the only public hospital in Australia solely dedicated to cancer. They have over 600 staff working around the clock trying to find cures for this disease. The hospital creates an environment of hope and aspiration at the most difficult time in people’s lives. Ciaron said: “Cancer has touched our family, as it’s touched a lot of families so we thought it was a great idea to be able to give back to a foundation like Peter Mac www.petermac.org who are so progressive. Donations are forwarded monthly and the stable aims to reach a level of $100,000 per racing season. Upon first glance, Ciaron appears he may be better suited as a beachcomber than a racehorse trainer. Even the stable’s corporate logo identifies with Ciaron’s readily identifiable hairstyle. Don’t let the laid-back easy going, personable demeanour deceive you. 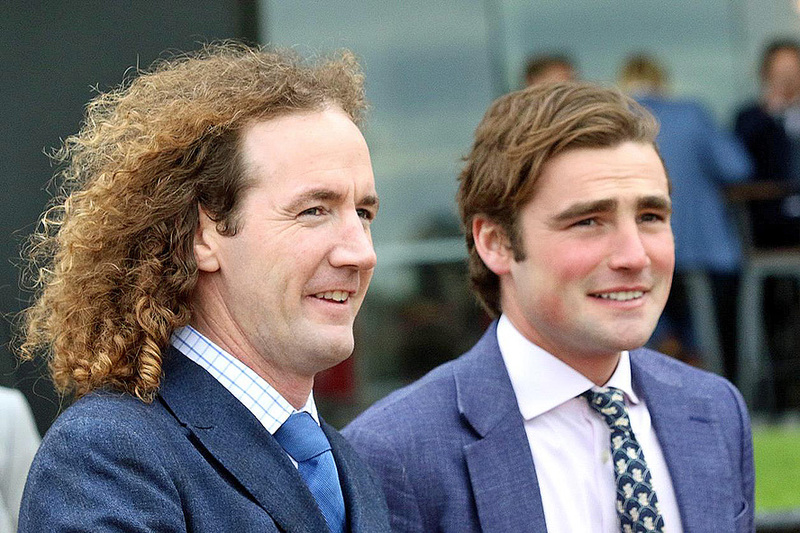 Under those trademark long curly locks lies a steely determination to train and race the best horses in the country. Now in his late-thirties, Ciaron has established himself as a genuine leader in Australian racing. Ciaron first tasted Group 1 success at just 26 years-of-age and has consistently built upon that success to now have 10 Group 1 wins and arguably the best winners-to-runners strike rate in Victoria. In a recent interview Ciaron said: “I decided I was going to train when I was 24. I had just come back from working in Dubai. “My dad and I owned a horse named Spectacular Storm and I said to dad at the time that I would like to give training a go for a couple of years and if I was no good at it, I would return to the run the family farm." Tear’s I Cry would eventually retire with 10 race wins and $908,340 prizemoney. Ciaron Maher Racing is made up of young, passionate and experienced people who all contribute to the team’s success on the track. Ciaron’s rare gift for preparing his horses to peak at the right time is born from his attention to detail and individual approach to each horse. In August 2018, Ciaron announced that David Eustace would join him as co-Trainer at Ciaron Maher Racing. This decision will ensure the success and growth of the stables for years to come. Since joining the team in mid-2016, David has proved the perfect balance with his intensity and meticulous nature complimenting Ciaron’s more relaxed approach. The Ying and the Yang matches perfectly for each other. David grew up in Newmarket England which is a racing town. His father trains at Newmarket having 30 boxes and has trained there for 26 years so David has spent his whole life in a racing stable. Intelligent and a talented amateur rider, Ciaron and David share a lot of common ground where they have learnt their trade. There is a lot of respect for one another. Both have a determined focus and an eagerness to achieve. David gets on well with all owners and connections. He is approachable, open to conversation, explanation and is a good leader within the stable. The staff all respect him and he has a great rapport with everyone. The Pakenham farm might be a nice little break from the rigours of training for the horses. Alternatively it’s the venue where horses having completed their spell transition with the basic foundation work before heading onto the main stable. However when out at Pakenham Farm, Ciaron employs the unique method of having all his horses do dressage and these results speak for themselves. The stable also send them out there at all different times of their preparations. Some fillies might just need a bit of a freshen-up like a weekend away - just like us! Some horses might need a week or more. Decisions are made upon the individual. Ciaron said: "We use dressage to get the horses muscle tone rounded up nicely and to move properly. It helps to develop muscle and balances the horse’s action. "They learn how to canter on each lead leg and how to use themselves. Such as how to get their back legs underneath themselves and drive off their back legs and how to bend and flex. "A lot of racehorses end up ridged and stiff because they have only learnt how to go in straight lines. "It’s a very important part in developing an athlete." Ciaron’s first Racing Season as a Trainer was in 2005/06. In his first season as a trainer, he started horses in 67 Races for 7 Wins and 17 Placings. His most successful horse that year was All Garhood who had 12 starts: 3 Wins and 6 placings. He also won a race with Spectacular Storm, Three Kings and Our Lotto. 564 Race Wins (15%); 858 (23%) Placings with earnings over $29.4 million. CIARON MAHER & DAVID EUSTACE. The partnership took effect at the start of the 2018/19 Racing Season which commenced on 1st August. After just 3 months the partnership is performing well and producing excellent results. There have been 230 Runners; 43 Wins (19%); 69 Placings (30%). We invite you to consider racing horses with the Dynamic Ciaron Maher & David Eustace.